The electrocardiogram can serve as an independent identifier of myocardial disease or reflect anatomic, metabolic, hemodynamic, or electrophysiological alterations in the heart. It can provide information that is often essential for the proper diagnosis and therapy of a variety of disorders and is without equal as a method for diagnosing cardiac arrhythmias. It is the procedure of choice for patients who present with chest pain, dizziness, syncope, or symptoms that may indicate risk of myocardial infarction or sudden death. Family physicians are often the first, and sometimes the only, point of contact for many patients within the health care system. The standard 12-lead electrocardiogram is one of the most common tests obtained and interpreted by the family physician, with most of the physicians reading their own recordings and basing clinical decisions on their findings. It has been shown that family physicians can achieve proficiency in the interpretation of over 95 percent of all electrocardiogram findings seen in the primary care setting. Although computerized interpretation is widely available, it is considered unreliable in up to 20 percent of the cases, making competency and interpretation by family physicians an essential skill. This book provides the necessary skills for family physicians to use in interpreting electrocardiograms, both in their offices and in the emergency rooms of their hospitals. It also should prove of value to other primary care physicians, as well as medical students and residents of nearly all medical specialties. 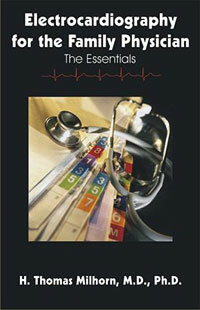 As the subtitle states, this book is about the essential elements involved in electrocardiographic interpretation. It is not all inclusive; however, it does cover the abnormalities most likely to be seen by family physicians in their everyday practice of medicine. This book is an outgrowth of a course I taught in the Department of Family Medicine at the University of Mississippi School of Medicine and five articles titled Electrocardiography for the Family Physician I subsequently published in Family Practice Recertification. In short, this book is the one I wish I had access to during the many years I actively practiced family medicine and when I was a resident in family medicine. I have made several changes in the second edition. These include adding sections on hypertrophic cardiomyopathy, the Sgarbossa criteria for diagnosing myocardial infarction in the face of left bundle branch block, left ventricular aneurysm, myocarditis, bigeminy, electrical alternans, Takotsubo cardiomyopathy, Brugada syndrome, and upgrading the terminology for acute coronary syndrome. I currently teach an ECG course to family medicine residents in the EC-Healthnet Family Medicine Residency Program in Meridian, Mississippi.